Oh, man. Where do I begin? I thought I had said what I wanted to say about this in my last blog post, but obviously there’s more to say. Danielle, our Events Coordinator here at Left Bank Books, forwarded to me this gem from Slate Magazine in an email with the subject, “your next blog post?” Before I even got past the title I knew I wasn’t finished with this topic, although I really wish I was. The issue: Farhad Manjoo (pictured), Slate Magazine’s Technology columnist, wrote passionately about the apparent idiocy in shopping at a locally owned independent bookstore like mine. It was a response to Richard Russo’s article in the New York Times defending the bookstore. Manjoo sets it up like this – Bookstores are “some of the least efficient, least user-friendly, and most mistakenly mythologized local establishments you can find” and are “cultish, moldering institutions.” His reasoning? Bookstores present a frustrating customer experience. You don’t need to browse because you can peek at e-books on your couch. Bookstores mark up their inventory to pay for rent, payroll, etc. which is inefficient. If you spend more money for a book, you can’t spend more money on “real” local goods. He does establish early on that Slate is an Amazon affiliate. Given their cozy relationship, it really shouldn’t be surprising that they – and he – would champion them. But let’s put that aside for the moment. Most of what irks me about Manjoo’s article has to do with what I posted last time – the smug assurance that shopping at a local bookstore makes you a chump. I think I said pretty much all I wanted to about not making your customers feel stupid for their tastes, so I’ll leave that alone as well. What I will take issue with is his assertion that independent bookstores are just the latest sacred cow that needs to be slaughtered in order to move into the Bezos led future. 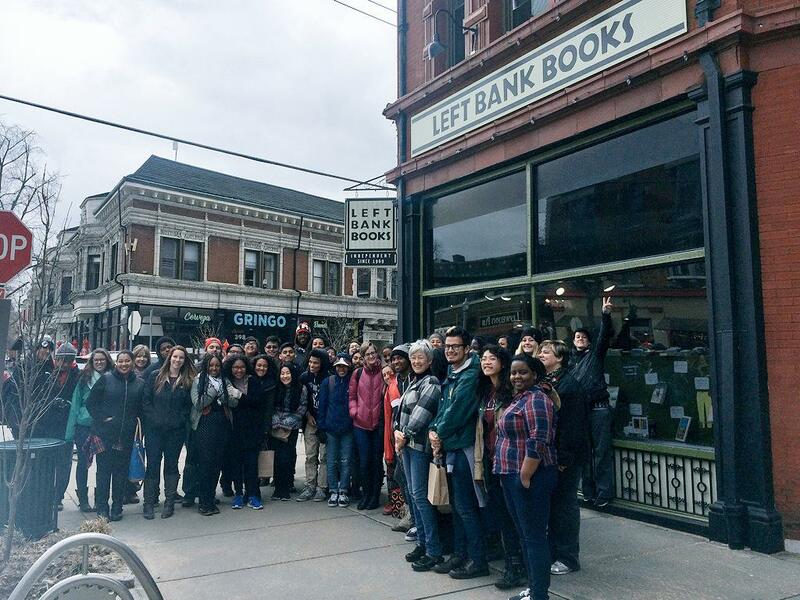 Rather than get into a protracted fist fight about Manjoo’s article, I think I’ll illustrate just what a locally-owned bookstore really does for you and your community, then you can decide where and how you want to spend your money. In 2008, Left Bank Books bought True Enough: Learning to Live in a Post-Fact Society by Farhad Manjoo from John Wiley & Sons, who listed the book (hardcover) at $25.95. We put it on our shelves as part of our “relatively paltry selection” and then sold it to customers at the list price, $25.95 plus tax. On each sale, we made $10.38. With our $10.38, we paid booksellers (creating and maintaining jobs), paid for our booksellers health insurance, paid our rent (helping to keep a vibrant and relevant neighborhood from being boarded up and abandoned), bought office supplies from Pedro’s Planet (a locally-owned office supply company), paid sales tax (maintaining the infrastructure of our community). If we sold the same book today to a member of our loyalty program, 1% of that would have gone to their chosen local charity. I think that’s a highly efficient use of that money, which, by the way isn’t a bookstore markup. It’s the actual price of the book. $15.57 went back to John Wiley & Sons, and of that, Mr. Manjoo received whatever royalty he negotiated with the publisher and John Wiley & Sons kept the rest. Yep, they’re in Manhattan. However, the $11,000 (our cost) worth of books from local authors who published their books themselves that we keep on our shelves are not from Manhattan. Neither are the books produced by Reedy Press and other local publishers, the cards and t-shirts produced by All Along Press, Firecracker Press, Sleepy Kitty, STL Style and other local printers. The customer who bought the book, ordered and hand sold by Left Bank Books employees, then probably went next door and bought clothing, food, lotions, etc. from other neighborhood stores, or, if they ordered from our website (which lists every book in print and let’s you create the all important wishlist) they received it at their home and used the internet to shop other local places because they value that. The customer who bought the book on Amazon also clicked through to other Amazon products and bought them there because that’s how Bezos wins, by selling books as a loss leader to make you buy other stuff. They did not log off, get in the car and go buy local as Mr. Manjoo describes. Speaking of authentic local experiences, we didn’t do an author event with Mr. Manjoo, but we do other events – around 200 per year – in conjunction with local libraries, churches, the Ethical Society, cooking schools, universities, high schools, grade schools, glbt centers and other local institutions. For free. The customers who didn’t buy that book looked at it on the shelf and noticed other books shelved next to it, and by serendipity picked up a book they would have never known existed if they relied on an algorithm to suggest it for them. They liked that book more than Mr. Manjoo’s book, so they bought that instead. Ah, you say, but what about e-books? Your precious corner store can’t give me those! Well, yes. Yes we can. In fact, with the help of Indiebound we offer free apps for your iPhone or Android to help you do just that. I guess all of this is to say bookstores are not “cultish, moldering” institutions, but physical representations of an industry that changes every single year. We are small, flexible and determined to change along with it. Not all of us will survive, but those of us who do will still serve an important purpose, and will still respect and support our customers and community.